Share the (non-medical) tips and tricks that help you in the day-to-day management of diabetes. 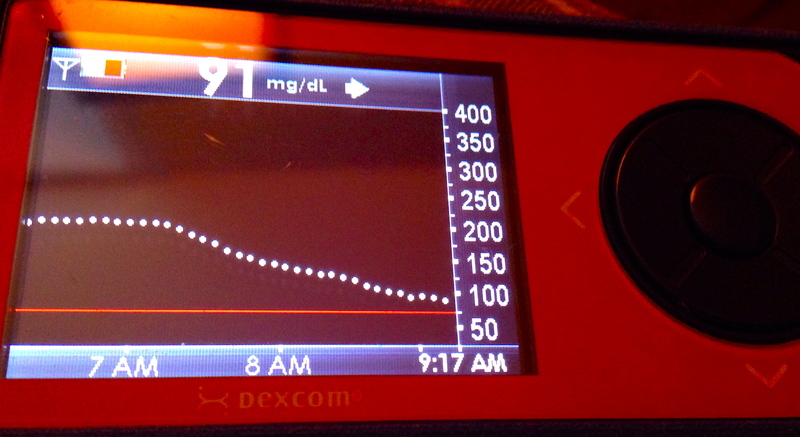 Tell us everything from clothing modifications, serving size/carb counting tricks to the tried and true Dexcom-in-a-glass trick or the “secret” to turning on a Medtronic pump’s backlight when not on the home-screen (scroll to the bottom of this post). Please remember to give non-medical advice only! Thank you Rachel of Probably Rachel and Kelley of Below Seven for this topic suggestion. Enjoy other DOC members’ Life Hacks too! I don’t know if what I have to say falls under “life hacks” or “how to keep sane.” Either way, I think it might be able to help people. So, the first day of Dexcom. On the day of insertion, I have learned not to insert it in the morning. It has nothing to do with accuracy or pain or anything important. Seven days later though, I don’t like waking up with the “replace sensor” screen. I try to work out in the mornings and don’t want to be forced into the 2 hour no-Dex period while working out if I can help it. This is something I’ve only figured out in the past month, and still forget, but when I do remember it makes life much more comfortable. For the first 24 hours of a brand new sensor, I turn off my high alarm. In theory, Dex would work perfectly after just 2 hours, but we know this is not true. I find that when it is alarming all the time, and incorrect, I go crazy. For the first 24 hours I turn off my high alarm. I can generally feel my highs, so this isn’t a problem for me. I also only calibrate when it asks for a calibration or before I go to sleep. Even though it means 24 hours of a not reliable Dex, I find it works better for longer when I approach the first day this way. I know this may not work for all of you, but these are two tricks that really help me not get annoyed with diabetes and the technology that goes with it. I hear you on the don’t replace sensor in the morning. I did that with my last sensor and wasn’t thrilled to be woken up by a “replace sensor in 5 hours” alarm at 3am. The following week I “replaced” it the night before. And great tip with the high alarm. I agree with you that the first 24 hours are way less accurate than the rest of the (several) week(s). In my opinion, d-hacks and ways to stay sane are one and the same. So thanks for the great sanity saving hacks!! I can’t TELL you how many times I was peeved at getting the “replace sensor soon” alarm at all sorts of crazy times (the most hated one, RIGHT before going to bed, because then you have to wake up in 2 hours to calibrate? NOT.) that finally clued me in to change it out at more accommodating times. Geesh. Every now and then, though, crap happens and it screws up the plan (like, an accidental rip-off, etc), but you just do what you have to! Totally agreed, that they’re good ways to not lose our sanity. I do the same thing with High alerts turned off, but not at sensor-change time; I turn them off every night when I go to bed, simply because I’m not worried about overnight high blood sugars. It’s the Lows that concern me, and I don’t want to go insane and be woken up all the time by highs that mean nothing. Briley, you are so smart. These kinds of small changes make a huge difference.